One of the most interesting things I have learned about personal finances is that things that seem to have absolutely nothing to do with money often have a huge impact on your finances. A good example is knowing what makes you happy. Another one was discovering that the more I know about my personality, the easier it is for me to save money. It took me a long time to realize that I did most of the things in my life out of habit without without giving them a second thought, but once I began to see patterns of how I acted and how this affected my finances, I could make decisions that helped instead of hurt my finances. One of the first discoveries that made this clear was the way that I eat. If snacks are around, I eat them. There are no ifs, ands, or buts about this. If they are in the house, they will be eaten. If there is one, I will eat one. If there are five, I will eat five. If there are ten, I will eat ten. Once I realised this was the way that I eat snacks, it had a tremendous effect on how I buy food in order to save money. The personal finance conventional wisdom about the best ways to save money on food is to buy the foods I eat on a regular basis when they go on sale and to stockpile them. On the surface, this makes perfect sense. For most people it probably does make the best financial sense. For me, it was costing me a fortune. When I go to the store and buy myself my favorite snack, I purchase one at its regular retail price of $1.00. Sometimes it would go on sale for $0.50. In this case, according to the bulk buying financial advice, I should buy 10 which would cost $5.00, but the snacks would last me 10 weeks and give me a 50% savings. The reality would be that I would end up eating all 10 snacks the first week so that buying in bulk actually cost me 500% more. Knowing myself and how I eat means that it’s best for me to buy a single snack for myself each trip to the grocery store which saves me more than buying in bulk and also means I feel a lot healthier. The more you know yourself and the way you act, the more opportunity you will have to save money. Taking the time knowing yourself will allow you to look at your personal financial situation to make the best decision for yourself to help ensure that you spend less than you earn. I just returned from a trip to my local grocery store. The store manager, who has been with the company for thirty years, was at the front of the store greeting customers. The employees who have been working there for the past ten years smiled and said hello as I walked by them. Indeed, most of the people I encountered in the store were quite friendly and pleasant. Then there were the more recently hired people who work at the store. I walked by one young man who has seen me at least two or three times per week for the past year that he has been working there. I said hello, as I do to everyone who works at the store as I walk the aisles. He responded with little more than a grunt and did not even bother to acknowledge me by looking at me to make eye contact. A few aisles later, a representative of a major beverage company was taking an inventory of his shelf space and completely disregarded my cheerful hello as I walked past him. I realize that people who are working cannot get their jobs done if they are stopped every three minutes for a conversation, but people who work with the public have to be ready to at least be polite and friendly so that customers feel welcomed and appreciated. That is the most important task of every person who works in retail. Sadly, based on conversations with store managers, it grows ever more difficult to hire young people who have the social skills that retail requires. A smile and a cheerful hello can very quickly make a patron forget about inconveniences experienced in a store. Cashiers can do their job and still exchange a few pleasantries. There is a cashier at my local grocery store who I have avoided for years. I am not alone because it seems that only tourists and newbies visit her checkout line. She shares inappropriate details about her life. She talks far too much and I don’t think any regular customers want to be caught in her conversations. If she were the only cashier, I would turn around and leave the store immediately. Everyone gets coughs and colds but try not to emphasize that to customers, especially when handling their food products. Wiping the tip of one’s nose with a finger and then picking up my jar of olives in order to scan it is just a bit too gross for me. When a customer asks how you are doing, you are always doing well. Remember that. Customers have their own problems and unless your customers are also your friends — your close friends — you do not need to dump your problems on them. If you work at a store, take the time to learn about the merchandise, especially where it is located. Know what is on sale. Employees are not ornamental. They are there to help customers and employees who do not know about the products sold will be of little help! What do you look for in the employees of the stores in which you shop? If you work in a store, what frustrates you about your co-workers? Are You Making Your Life More Complicated (And Expensive) Than It Needs To Be? Many of us find ourselves pressed for time and/or money, at least some of the time. And while it’s true that life can be harrying with it’s demands of cooking, cleaning, work, childcare, and maintenance chores, it’s also true that we bring some of those demands upon ourselves by doing way more than we need to do. Whether it’s because our mothers did it that way, or because it fits into society’s image of what a certain person is supposed to do, we sometimes take on things that are unnecessary and incur a lot more stress and expense as a result. Here’s one example: I have a neighbor who washes and folds her family of five’s bath towels, washcloths, and sheets every day. Every single day. She says she hates doing it, but she believes that sheets and towels aren’t clean enough for more than one use. Her mother did it that way, so now my neighbor does, too. In addition to the time it takes to do this chore daily, it’s also costing her money in electric and water bills, detergent, and increased wear and tear on the linens. She’s always complaining about being stretched for time and low on money and I can only think to myself, “Try washing your stuff just once or twice a week.” Unless the people in the house are absolutely filthy or sick, sheets and towels are good for several days before they need washing. I have another friend who must clean her bathrooms every day, all three of them. And not just a quick wipe down, either. She fully cleans the toilets, sinks, tubs and floors every day. Again, this is a waste of time and money unless you live with pigs or someone is sick. Think of the money she’s spending on cleaning supplies every year, not to mention the time involved. A quick wipe down of the most frequently used surfaces would suffice, and even that is overkill in most homes. A bathroom really only needs to be thoroughly cleaned once, maybe twice, per week. This is another person who regularly complains of having no free time and little money. She’d free up at least an hour a day if she let the bathrooms go. There are other things we do, as well, that we don’t really need to do so often. Oil changes every 3,000 miles: Most cars can make it 5,000, so unless your car has specific requirements, waiting that extra 2,000 miles can save you money and time spent at the lube shop. Driving kids all over town: I know people who seem to do nothing but drive their kids around all day. They drive them to and from school, then to activities all afternoon and into the evening. Yet the school offers a bus and two other people on their street are going to the same activities. Save time and money by putting the kids on the school bus and organizing a carpool for activities, or cut down the number of activities your kids participate in. Mowing your grass every week: In many places in the country, there are only a few “peak” lawn weeks per year when the lawn grows at a crazy pace. In the spring and fall or during a drought the grass grows much slower. Yet I see many people out every weekend mowing their hearts out, whether the grass needs it or not. If the grass isn’t out of control, let it go for two weeks and save the time and the gas money. Going to the grocery store multiple times per week: A lady I work with stops by the grocery store every afternoon after work to pick up food for that night’s dinner. While I applaud her for not eating out, I shake my head at the time and money she’s wasting. Every trip to the store is at least thirty minutes. And we all know, the more time you spend in the store the more you’re likely to spend on impulse buys. I suspect that these trips are eating up much more money that she realizes or plans for. If she sat down and planned some meals, only shopped every other week, and bought a lot of sale items, she’d save money and time. Going to the salon every week: I know many women who go to the hair salon every week or every two weeks. Yet they could probably stretch it to three weeks, or even a month without much difference and pocket the savings of time and money. If your style is that demanding, maybe you’d be better served by a simpler ‘do. Volunteering for every activity: Do you volunteer to host or organize every school or church event, at your own expense of time and money? Maybe you feel it’s expected of you or you feel like no one else can do it right. Whatever the reason, think about saying no. Volunteer for one or two things a year and let someone else pick up the rest. If it doesn’t get done or done well, so be it. You’ll enjoy a huge savings of time and money. If you find yourself pressed for time and money and feeling stressed out, ask yourself how much of that you’re bringing on yourself. What tasks do you find yourself doing that may be unnecessary and waste time and money that could be better spent elsewhere? What things are you doing out of habit or expectation and not because they really need doing? Think about your day to day routine and identify the things that you can change or do differently to free up some time and money for more useful, fun things. The only thing I used to do to save money on groceries was to make a list before each shopping trip and stick to a monthly grocery budget. I didn’t use coupons because I figured I saved more money by purchasing store brands (preferably store brands on sale) and shopping at discount stores and farmers markets. I wouldn’t buy everything on my list sometimes — if something was too expensive that week, I would either do without or substitute for something cheaper. I didn’t clip coupons and I didn’t even get the weekly grocery ads in the mail because I had unsubscribed from them and every other conceivable form of junk mail. The percentage savings may seem a bit inflated to you. The reason the percentage savings are so high is because many chain grocery stores have high regular prices compared to what you might spend for the same item at a discount mass retailer like Target or Walmart. However, because many chain grocery stores double coupons (or partially “double” them-for example, giving you $1.00 off for a 55-cent coupon), you can still come out ahead at the grocery store if you use the sale/coupon method of shopping. Also, no matter where you shop, free is a good price for a full-sized tube of toothpaste. had a coupon for it, so I actually made $1 on the transaction. This happened because I was overcharged for the item and brought it to a manager’s attention. He refunded the full price of the item and let me keep it, too. Paying attention during checkout and reviewing your receipt carefully before you leave the store are important components of getting the full savings you should on your groceries. I almost never buy anything at the major chain grocery stores anymore unless the item is on sale and I have a coupon for it. I plan my shopping in advance by looking through the weekly ads and using the Coupon Mom website, which has a database of the unadvertised deals at grocery stores across the country (updated weekly) and even tells you which sale items have coupons and where you can find those coupons. I usually only buy about 10-20 items per week that represent the best deals on the types of products I would buy anyway. And if there’s an item that’s still not a good price even with a sale and a coupon, or if it’s something I don’t need no matter how good of a deal it is, I generally don’t buy it. However, I have bought a few things I’m not sure I’ll use because they were so cheap ($1 or less) and I can always donate them to charity if I end up not using them after a few months. Finally, this shopping method has allowed me to start accumulating a stash of emergency food and water for both my home and my car. I’ve always put off doing this in the past because I couldn’t see spending $100 or so on food that was just going to sit around. Now that I am regularly getting grocery items for 50 cents or $1 each week, I am able to inexpensively accumulate emergency items. It’s also important to note that some sale prices are better than others. One week pizzas may be on sale for $4.50, while another week the exact same pizzas may be on sale for $3.50. Once you start paying closer attention to sale prices (and perhaps even keeping a grocery price list), you’ll know then the best time to buy is. The best prices usually roll around every few weeks, and you should stock up and use your coupons then. If you’ve been looking for a way to cut down on your grocery bill, I highly recommend trying the Coupon Mom’s method. Once you get the hang of the system, you won’t be spending much time clipping coupons or planning your shopping trips, and you’ll be amazed by how much money you’ll save. I would rather go to the dentist and get a root canal before going to the grocery store, but sometimes there are major emergencies, such as running low on beer, that necessitate a trip. The other week I had one of these emergencies. The plan was to go in, grab the beer and get out as soon as possible. The plan failed miserably. I headed to the aisle where you can scoop candy or nuts out of bins. Everything appeared to be going well. I found the beer nuts that I wanted and it seemed that I would be able to get them and escape without any problems. I was half way filling my bag when I noticed the kid. He was at the opposite end of the aisle making his way toward me by opening up a bin, sticking his hand in, grabbing a handful of whatever candy happens to be in that bin, taking it out and shoving it into his mouth at which point he opens up the next candy bin — rinse, wash, repeat. At this point I’m thinking I should just ignore the entire situation and get the hell out of there because nothing good is going to come from me watching this kid and thinking about how he is sticking his hand into his mouth and then back into the bins again. At that moment, the kid lets out a tremendous sneeze. Even from a distance I could see the yellow, gooey mucous stream out his nose as it hung on the edge of his lip. He took his hand and wiped it from his face and in another swift motion, onto the pants he was wearing. He’d obviously had much practice at this. Then it was back to sticking his hands into the candy bins as he continued his quest to contaminate every single one of them. I look at my half filled bag of beer nuts and decide that they really didn’t seem nearly as appetizing as they did a few minutes before. I decided to dump the half filled bag back into the bin and chalk the entire incident up to experience and one more reason why it’s never good to go shopping at the grocery store. As I was doing this, I hear an angry mother telling the kid to stop eating all the candy. 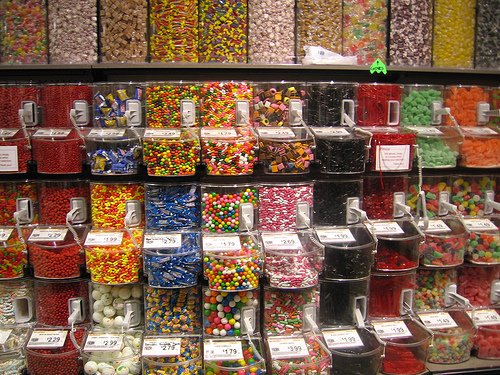 The mother came down the aisle and tells the kid to pick just one type of candy. He chooses chocolate covered malt balls and she begins to fill the bag. At this point I have already abandoned my bid to get beer nuts and I know that a quick retreat with my beer will be in my best interest, but I fail to yield to common sense. Walk away, walk away, walk away I can hear my brain pleading. Take the beer, get out of the store and enjoy the rest of the afternoon. Chalk it up to another reason that I should never venture into a grocery store and learn from the lesson. But of course, I can’t leave it alone. The fact that both the kid and the mom think it’s okay to take candy out of the bins and eat it without paying for it bothers me, but the fact that the kid was doing it with filthy hands was even more of a concern. “I don’t think it’s as much an issue of him eating the candy as that it’s unsanitary,” I say, trying to remain civil. The woman glares at me. “He’s just a kid. Get over it,” she says and turns back to scooping out more chocolate covered malt balls. At this point I realize that there is only one thing I can do short of hitting this lady upside the head to knock some sense into her. “I understand,” I say, sticking my finger up my nose and begin digging away. The lady looks at me like I’m nuts as she takes a step back. After digging for a few seconds, I grab the plastic bag of chocolate covered malt balls that she is holding, stick my recently prospecting finger into it and even swirl it around a bit just for fun. “My point exactly,” I say handing her back the bag of chocolate covered malt balls as I walk away. It is situations like this that make me wonder why anyone would choose to go shopping over having their groceries delivered to their home? There are many reasons I choose to have my groceries delivered (I get free delivery in my area, no impulse purchases, it saves me time and no gas costs to name a few), but I would be lying if I didn’t say that avoiding people like this woman and her son rank quite high on that list. Oh, and the next time you feel the urge to buy candy or nuts out of those bins, don’t forget to think about all the kids’ hands that have recently been in there. That should save you a buck or two. Related Reading: Am I the only one that realizes that having my groceries delivered makes financial sense?